Although I had gotten back on my bike yesterday, that ride hadn't been much more than a welcoming warm-up to life in the saddle. 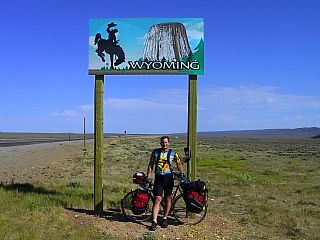 To give myself a real workout I decided that my destination today would be Rawlins, only 110 miles away and across the Wyoming Border from Colorado. After shaking off the water the park sprinklers had deposited all over my tent and gear I packed up and rode over to the RV housing Mark, Emily, and Jackie. Once in the mothership I was treated to a quick breakfast before hitting the road with Mark and Emily. After riding just a few miles out of town we were joined by Peter, Stan, and David and I was bemused at the fact that somehow I had gone from being completely alone yesterday to being part of a pack of six riders and semi-supported by a motor home. I found myself very surprised by the way my body responded to bicycling again. I expected that after a two-week break I would be out of shape and struggling to keep up but instead I found myself leaving my five fellow riders, including the unloaded tandem, completely behind. It was only when I stopped to wait for them in the town of Riverside that the tandem riders and their orbiting mothership caught up. The four of us ducked into a cafe for a quick lunch and to give the New Zealanders and their Bostonian travelmate a chance to join us. But when the three trailing riders came into town they apparently didn't see the bikes and mothership parked outside the restaurant, and we haven't seen them since. I spent some time chewing over the idea of what sort of pace I should set now that I had returned to the trail. On one hand I'd like to return to the relaxed pace of the early part of this endeavor, but on the other now that I am capable of 100 mile days it is hard to imagine quitting after only 30 or 40 like I used to. In the end, I decided the best thing I can do for now is just be open to whatever happens. Wyoming in particular will remain a place with long distances between towns so there won't be any shortage of opportunities to crank out the miles. The real test of this decision came when we reached the town of Saratoga after 70 miles of riding. I really wanted to make it all the way to Rawlins for the evening, but for no reason beyond just making the miles. 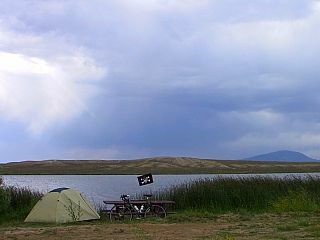 If I stayed I would have the company of the mothership gang, a lakeside spot to pitch my tent, and free use of the hot springs in town. If I kept going I would be alone in Rawlins with my tent pitched over a pile of gravel. The very fact that I debated the decision only shows how addicting I had found the lure of pushing for distance. In the end, of course, I stayed in Saratoga and soaked in their wonderful hot springs. In the evening, from the shore of the lake, I looked at the Milky Way stretched high overhead and I remembered once again how much I love being away from the cities and the ever-present light pollution that steals the beauty of the night sky from our lives. I was reminded of the Native American legend that tells of the Creator’s wish to put the stars in the sky solely for the purpose of letting us know that he loved us.